Pandora has officially completed its acquisition of digital audio ad tech platform AdsWizz. In the end, the $145m deal – initially announced in March – will cost Pandora $66.3m in cash and 9.9m shares of Pandora common stock. An additional $5m in cash is payable upon achievement of certain milestone provisions in connection with the acquisition. “Audio is the fastest growing format in digital advertising and the marketplace is rapidly evolving,” said Pandora CEO Roger Lynch. The timing of the AdsWizz deal comes at an interesting juncture for Pandora: in Q1 this year, the company actually saw its advertising revenue fall year-on-year, down 3.9% to $214.57m. However, in the same quarter, Pandora’s subscription business turned over $104.67m, up 61.3% year-on-year versus the $64.88m posted in Q1 2017. Advertising made up 67.2% of all the company’s sales in the three months. Alexis van de Wyer, CEO of AdsWizz, said: “We built the AdsWizz platform using innovative technology in service of a simple idea: provide value to all stakeholders in the digital audio ecosystem – including brands, listeners and publishers – with relevant, engaged and highly targeted advertising experiences. This will not change. AdsWizz will operate as a standalone subsidiary of Pandora, continuing under Alexis van de Wyer’s leadership. 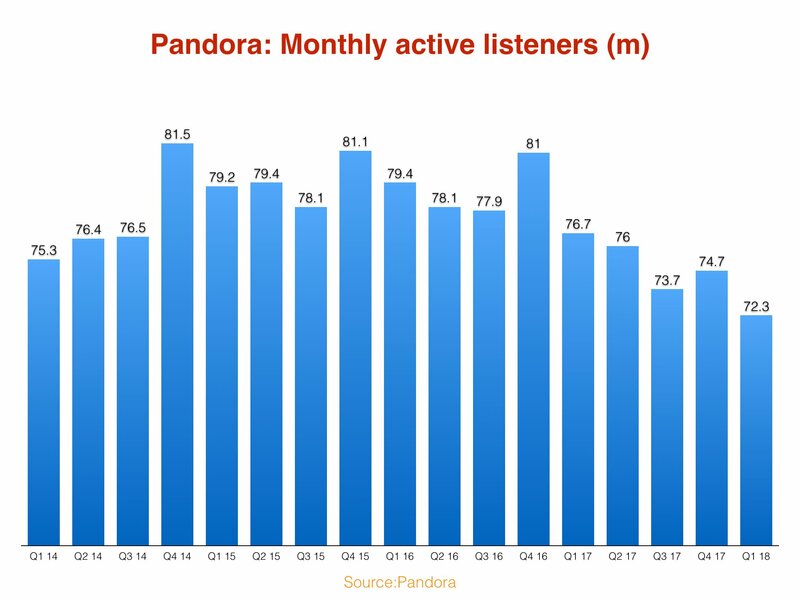 Pandora, which has taken to calling itself ‘the largest music streaming service in the US’, had 72.3m active listeners at the end of Q1 2018. That represented a 4.4m fall year-on-year and a 2.4m fall quarter-on-quarter. Pandora yesterday (May 29) announced that it is launching a $14.99-a-month family plan to rival that of Apple Music and Spotify.